Discussion in 'Tracks' started by Prototype, Dec 30, 2018. 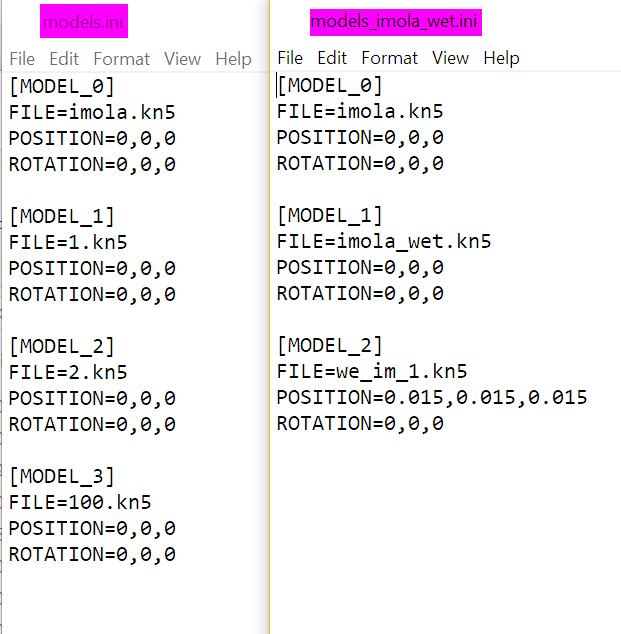 There are 2 reasons for multiple kn5 files @Prototype . 1/tidiness, as @Johnr777 mentioned already . Right ... yeah so I want to have a "dry" and a "wet" track ... so the visual road mesh and anything else that has a material change to make it look dry/wet would be a separate kn5 that loads into the main kn5 scene .... ? Simply put, using the layouts feature, every kn5 will act as a "layer" in your typical 3D application. And they will load on top of each other. They will also be aligned, provided they have the same origin. (You can make a test inside SDK Editor also - load one kn5, then load the next one). So even if you don't have multiple configs for a track, but wish to use this apptoach (with multiple kn5) you need to apply the same teachings from the link above. In your case @Prototype, you will have in fact at least 2 configs (one dry, one wet) so you'll need to use the layouts feature. I get the layering fbx files into AC Editor aspect of it. I guess what I'm trying to ask is, how does the "navigation" and folder setup for AC work? I'm sure I can figure this out, but if someone already knows how to do this it saves time and would be super helpful for myself, as well as anyone else wanting to do multi config tracks. Is it just a case of having various "MODELS_*.ini" files that call up the various configs? 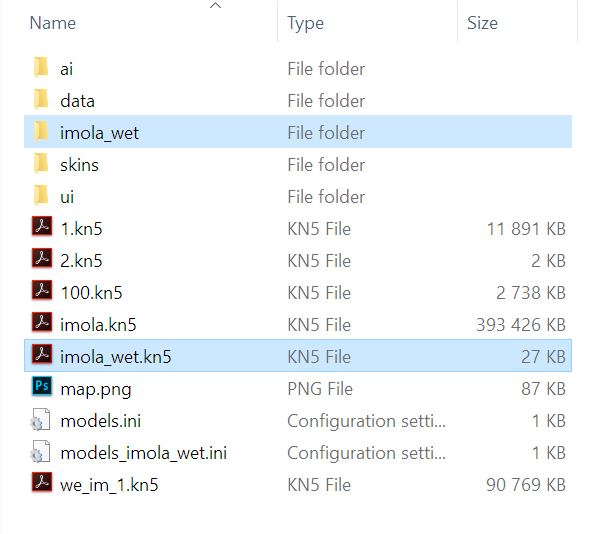 yes, a new models ini and new folder for the Ai data and other data just like imola wet folder there . on the top level you can remove the ai and data folder there for they exist in the imola wet folder now. 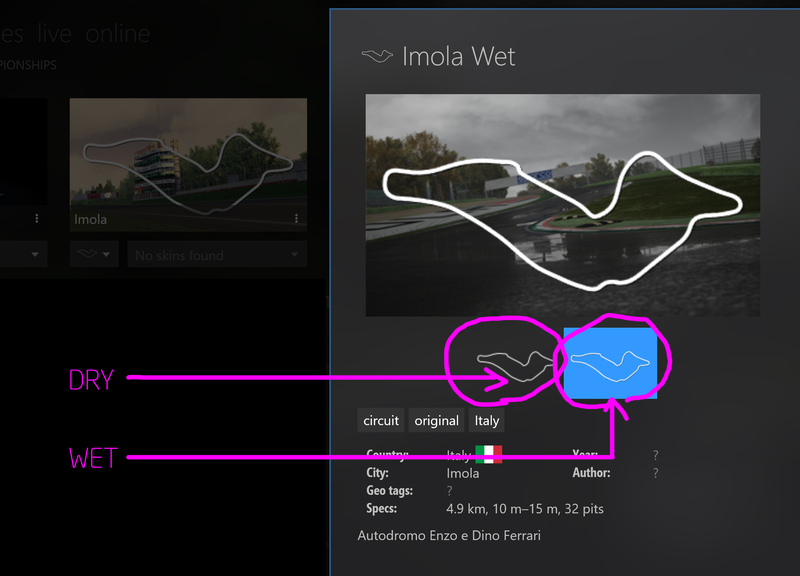 ALSO in the imola wet folder is the map.png file for your track layout which will change the track map in the UI when there is an AI line for it. so ai folder and data folder and map.png into this newly created folder. there is no layering per say, but the data for the track is taken to the new layer (folder) while the fbx files remain loose and next to each other and the .ini just points to the new data. (provided that the wet version has its own data, ai folders). Also make sure that in the UI folder, you have folders containing the (outline, preview, ui-track.json) for each config. Keep the same naming. Have a look at one of the Kunos tracks, e.g. Vallelunga. Yup, still going but been on the shelf since early March. Hopefully will be able to get back onto it in the next few weeks or so. Tibor Solyom and ndv99 like this. Thanks chaps! @Johnr777 + @luchian - both excellent resources. Had a quick first look over them - got the gist of it. Pretty interesting way to do this. Makes a lot of sense. Thank you both. I want to hit my Milestone 1 and 2 for completion plan before sharing anything publicly. So I'd say in the 2-3 weeks ... ? The "man days" above are actually really 2-3 hour stints (as this is the average time per day I've set aside for this project). Got a lot of other responsibilities on a daily basis to take care of! Good lord, I can't continue reading this thread without saying "HOLY SMOKES MAN YOU'RE MY NEW TRACK MOD HERO !!!" Well thats very kind of you, but this really is my first rodeo and Ive got a lot still to learn. This track would definitely have been at a lower level to what its pushing toward now without the help and resources on this forum. I'd look to those who have actually released tracks! But thanks for the kudos !